As a part of your subconscious, the genii is a specific divine figure with an unspecific content flowing through every living creature representing the intercessor between the realms of God and man. The genii attends man throughout the duration of a life as his second or spiritual self, forever influencing and shaping ideals that the Gods set forth. As far as the literary testimonies concerned, what stands out is the overwhelming ratio of personal individual Genii, a revealing aspect for the central feature of this religious phenomenon, it’s paradoxical character that can be seen in every culture and religion. Every Human at birth receives a genius. The genius can be conceived as a friendly towards one person, and as a hostile towards another, or that it manifested itself to the same person in different ways at different times. The other popular theory is that we obtain two genii, one for the power of good with the other to the power of evil, and that at death depending on the influence we either rise to a higher state of existence or are condemned to a lower one. Along with the two different types of genius there are two different names regarding the gender that it resides in. Women called there genius Juno, regarding the genii of men as being in some way connected with Jupiter (mythindex.com). Among the Romans the name genius was given to the God who had the power of doing all things. The genius was a God who had the power of generating all things and presiding over them when produced. The Genii are emanations from the great gods that would act as the mediator; the agent that interprets the gods’ wills onto mankind, to keep the harmony between dimensions in order (Encyclopaedia Perthensis). The genii was normally depicted as a winged character by the cultures of the near middle east. 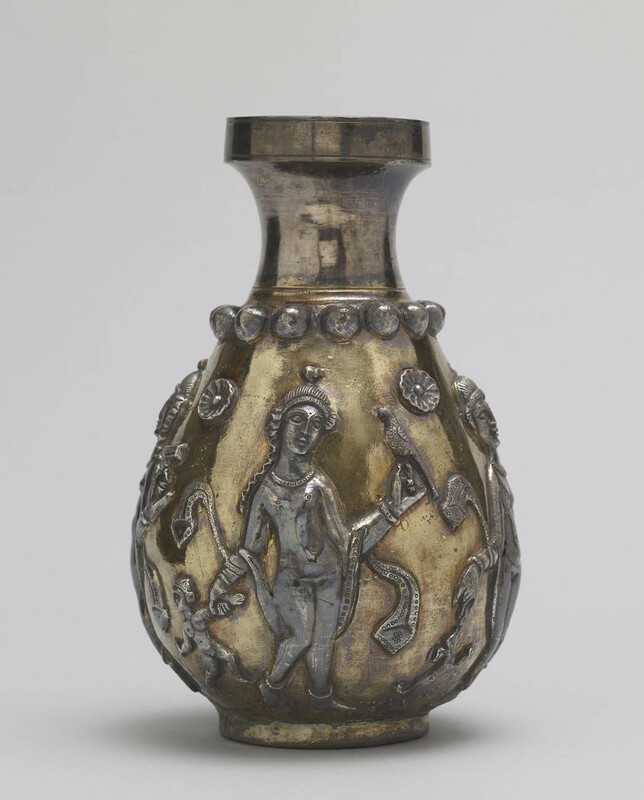 However, the interpretation of this 5th-6th century bottle can more accurately describe the role the genii plays. On the outside there is a flowing pattern using four main characters who have women’s bodies with a men’s faces representing the genii is equally a part of both genders. Each of these characters hold different objects, such as; a child, a plant, a bird and an offering plate, alluding to the fact that the genii resides in all living aspects of the world. The object being the bottle describes the idea of the genii living inside of every living thing, as part of who we are, how are personality is, our life blood.